A 2018 Most Anticipated Young Adult book that is part Wonder Woman, part Vikings—and all heart. OND ELDR. BREATHE FIRE. Raised to be a warrior, seventeen-year-old Eelyn fights alongside her Aska clansmen in an ancient, rivalry against the Riki clan. Her life is brutal but simple: fight and survive. Until the day she sees the impossible on the battlefield—her brother, fighting with the enemy—the brother she watched die five years ago. Faced with her brother's betrayal, she must survive the winter in the mountains with the Riki, in a village where every neighbor is an enemy, every battle scar possibly one she delivered. But when the Riki village is raided by a ruthless clan thought to be a legend, Eelyn is even more desperate to get back to her beloved family. She is given no choice but to trust Fiske, her brother’s friend, who sees her as a threat. They must do the impossible: unite the clans to fight together, or risk being slaughtered one by one. Driven by a love for her clan and her growing love for Fiske, Eelyn must confront her own definition of loyalty and family while daring to put her faith in the people she’s spent her life hating. What worked: This is a highly engaging historical tale of a teen warrior who is taken by a rival clan and finds out her beloved dead brother is in fact very much alive and now a part of the hated Riki tribe. Seventeen-year-old Eelyn is tough and true to her Aska clan. What I loved about her is her loyalty to her clan even after she's captured. Eelyn shows true courage and strength throughout her capture. Fiske is her brother's friend. At first she wants nothing to do with him and hates what he does in order to save her life. She's from the hated Aska clan and more than a few members of the Riki clan show their true feelings towards her. Slowly though a chemistry builds between Fiske and Eelyn. She fights it, fearing by giving in to this emotion she will betray her clan and family. There's lots of gritty scenes throughout this action packed novel. I'm a big fan of the TV series The Vikings and this novel reminded me so much of that series only with teen protagonists. Captivating historical novel with a strong teen warrior protagonist who must confront what family really is while putting her faith in a clan she's been taught to hate since childhood. Add a bubbling romance for a winning combo. Riki and Aska are two clans that are fated to fight for following different gods. The Aska believe in Sigr and the Riki pray to Thora. During one of the battles, Aska warrior Eelyn sees her brother Iri wearing Riki armor. It's the same brother that she thought was dead. Not being able to let him go a second time, Eelyn finds herself being taken by the Riki to be traded or enslaved. But her brother has other plans. Fiske, Iri's friend, buys Eelyn in order to keep her safe at Iri's request. Because of that, she is brought to Fiske and Iri's household and instructed to lay low. Eelyn was never one to hide the fire within her or remain prisoner. However, the more she protests against the Riki, the more she realizes how similar they truly are to her clan. There's also a different type of enemy out there--a common one--and Eelyn may be the only one who can save both Aska and Riki. I loved watching the romance flare and burn between Fiske and Eelyn. Adrienne Young's writing is so vivid and vibrant that I could see the scenes and feel the emotions crisply as if I were watching it all play out. This book will draw you in and make you finish it in one sitting. Final Verdict: This book is perfect for fans of mythology, action, and romance. This goes onto the list as one of the best books in 2018. My only complaint is that the fight scenes were a bit confusing and at times too short. I would recommend building up to the scene and explaining the events more clearly to avoid confusion. I finished Sky in the Deep in one sitting, because I just couldn't put it down. I have applaud Adrienne Young for the character development and her amazing ability to make her readers feel every emotion. The hate and love and conflict seemed to bubble from the page. All in all I loved reading this book. It was an amazing story that will stay with me for a long time. I thought that Adrienne truly caught the essence of human emotion, like the abilty to love and hate at the same time. This is a story about forgiveness, healing and finding your way home. If you’re looking for an action-packed novel with a fierce female main character who is multifaceted, and the text is filled with historical accuracy that doesn’t show violence against women, then look no further than Sky in the Deep. Adrienne Young’s YA debut is definitely something every book lover should read. The novel draws you in from the very first page with its intense fighting scene, and the story never dulls due to Young’s first-rate writing. I absolutely adored Eelyn. You know how this this trend in the media of having powerful women who are heartless and unloving because they have to be a “strong, independent woman” and nothing else? Yeah, Eelyn’s not like that. She’s strong, absolutely, but she’s also vulnerable and she cries when she’s stressed but then a day later, she’s pulling a man’s eye out with her bare hands, and then is in shock that she was able to do such a thing. She’s a complex character and I loved reading her amazing journey from honourable warrior to angry, frightened slave to clan hero. Also, the romance was i n c r e d i b l e. At the beginning of the book, I was concerned about the person Eelyn would fall for as Fiske had a greater position of power over her, but there’s no need to be concered. The romance is so soft and subtle and sneaks up on you: it comes through in the tiniest and sweetest of ways, and you can’t help but ship them together. I also loved Eelyn’s relationship with her brother, Iri. Eelyn is understandably devastated and angry when she learns the truth about her brother – that he has been alive all these years, living with their enemies – and she struggles with balancing the love she has for him and coming to terms with his betrayal. Their relationship is very different from when they were children and I enjoyed reading about Eelyn learning about Iri’s life and coming to new realisations about the people she once thought were her enemies and how they were not so different from her people after all. 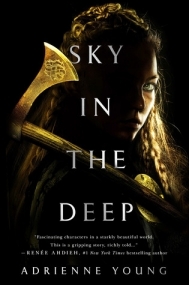 Sky in the Deep is an incredible, emotional story about one woman’s extraordinary journey to unite to warring clans and finding love along the way. It’s a must read! I found myself at lost for words on how to describe the magnificent that is this book. Sky in the Deep left me emotionally distraught--in a good way--and craving for more. I was on edge waiting the whole time reading for what is to come next, but at the same time, I wanted to slow down and not let it end. AHHH! It is not a story to be taken lightly, for it is filled with heart and soul. Adrienne Young has flawlessly captured the five senses into her writing giving me front seat row in the story. Every word that was uttered was done carefully and purposefully making you not want to miss a single thing said or done. Sensitive topics such as religion and family were approached in a way that made one listen, understand and feel. The story has a focal point on something that many ya books do not touch much on: family, sibling love, friendship, forgiveness and raw open sweet romance. There is no ya novel, to my knowledge, that has so wondrously captured the open, jealous, and tearful sibling love between a main character and brother. I have utterly and un-shamefully given my heart to this book. Even though the book is told from a single person point of view, I was able to thoroughly connect with all the characters in the book without feeling any resentment towards any of them. The main character had the aspects of what a true heroine should be like: fierce and independent yet vulnerable and rational. This book blew my mind. I did not want it to end. I don't know what to do with myself, now. Like, what other books out there can equal this one. This is a story that I am going to reread forever. I will never be able to get over how fantastic this book is. You will regret passing the opportunity to read this book. Truly from the bottom of my heart, REEEEEEEAAAAAADDDD!! THIS BOOK!! Great strong woman character in Eelyn, I couldn't get enough of this book! Out of the box plot that had me eagerly pouring through the pages!